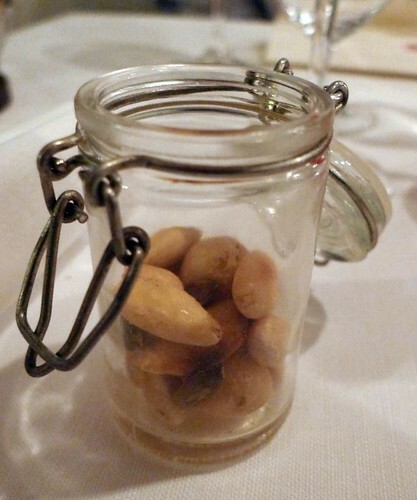 The cutest little jar, filled with almonds and macadamia nuts that were smoked. A great start! We don't eat out a lot, but as we recently celebrated our tenth-year anniversary (that's ten years since we met - we've only been married for a little under four) we decided to really treat ourselves. 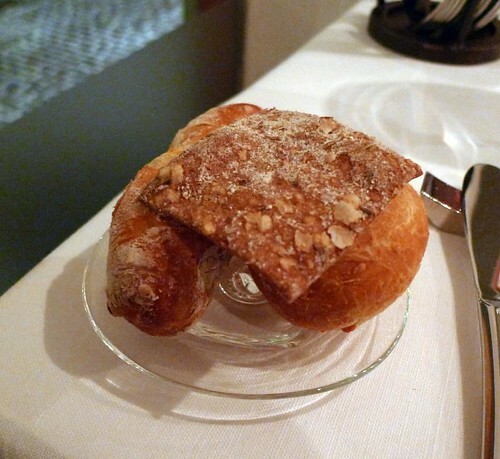 We chose Frantzén/Lindeberg which is a small restaurant that opened about a year ago. 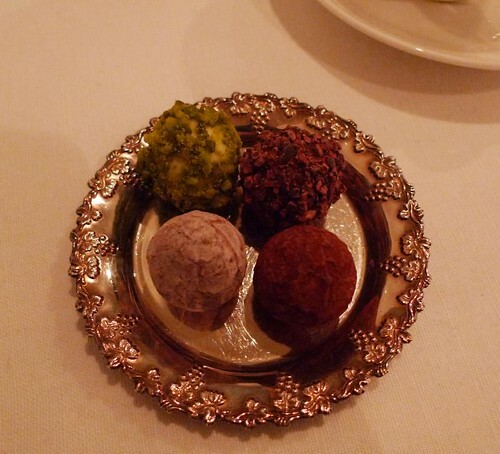 They come highly recommended from many sources, and serve a fantastic and fun menu. 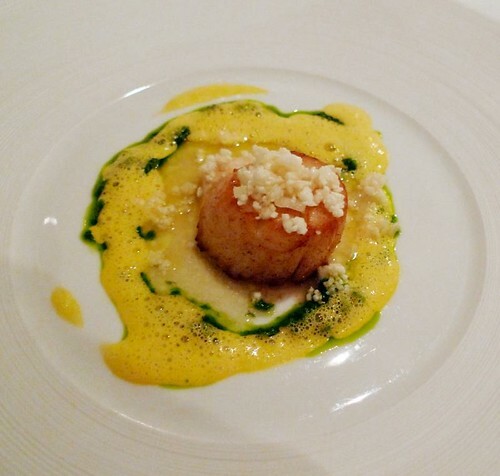 And just today, they were awarded one star by the Guide Michelin! Congratulations! 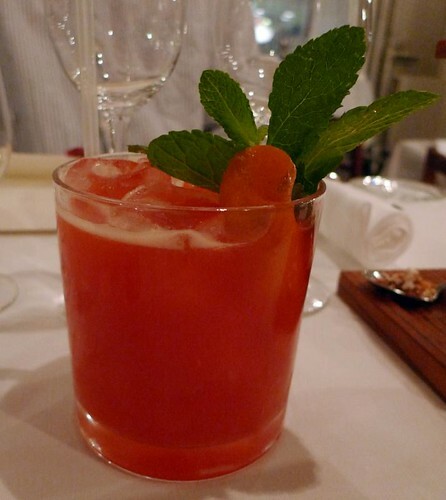 My drink - orange, strawberry and pineapple juice. 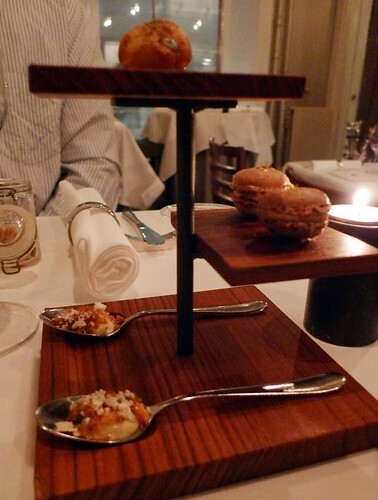 A tower of amuse-bouches. At the bottom was a spoon with garlicky purée and crispy chicken skin. 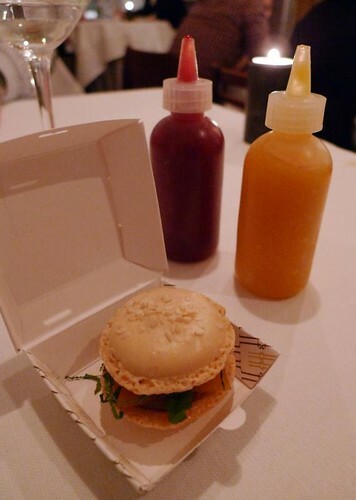 Next was a tiny macaron with foie gras and pear. On top is a little puff pastry with blue cheese, that only Per got. Our first appetizers. 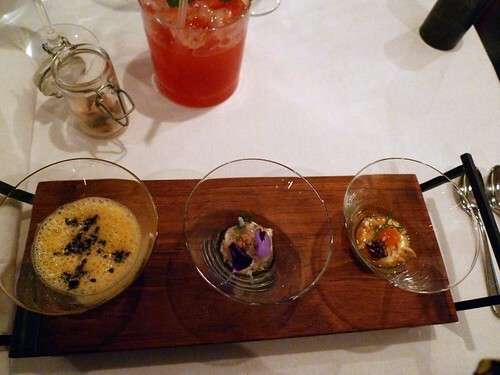 From right, it's a truffled pumpkin soup that was very rich, something with spider crab and some sort of jelly which was really the only dish I didn't love, and something that I can't for the life of me remember! 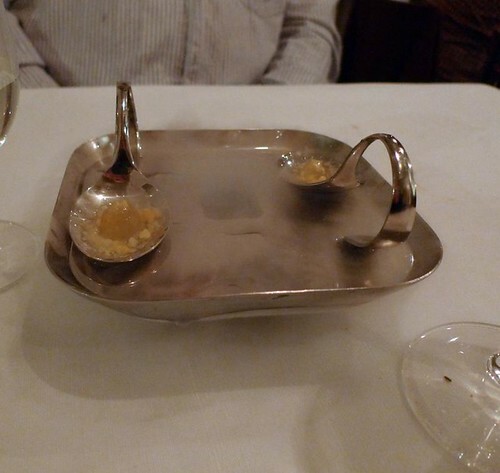 Per got a beef tartare instead of the soup, on top of foie gras. The meal was incredible. Just incredible. I took photos of everything, but I didn't take notes so I can't tell you *exactly* what we ate. Everything was described in detail by the two servers though - and they were also sommeliers. It's a tiny dining room, with just 16 seats, and there are no additional waiters. 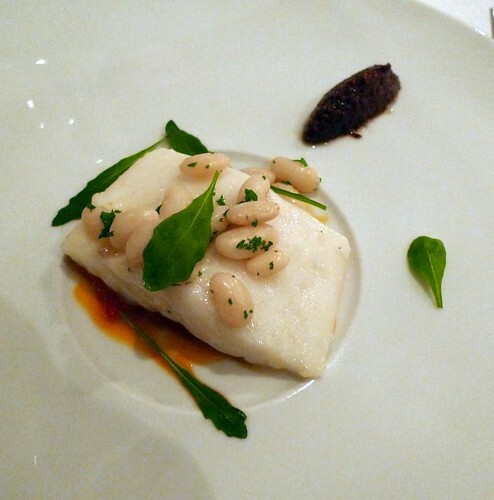 So, the sommeliers did all the serving, and they were really extremely knowledgeable about both the food and the wine. Per got the wine package, and it was definitely worth the extra money. I stuck to water... (but I did try a sip of everything he got.) The attention to detail is just stunning - everything is thought of, and we were made to feel extremely welcome. The whole meal was exciting - we couldn't wait to see what would come next, and it was just so much fun! Brilliant bread - we were encouraged to try a piece of each. 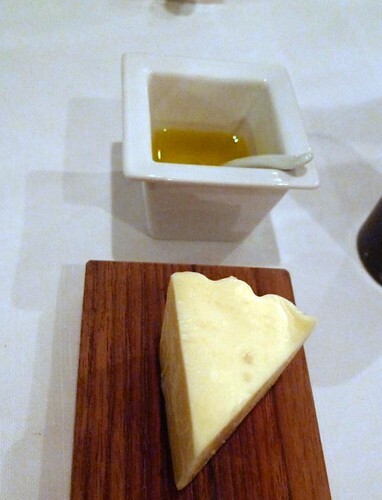 And excellent olive oil and super-tasty butter that was imported from.. somewhere. It was much saltier than regular Swedish butter. 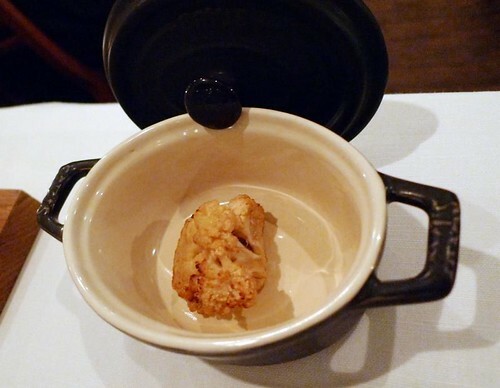 Which was served with some smokey-roasted cauliflower. More bread and butter. 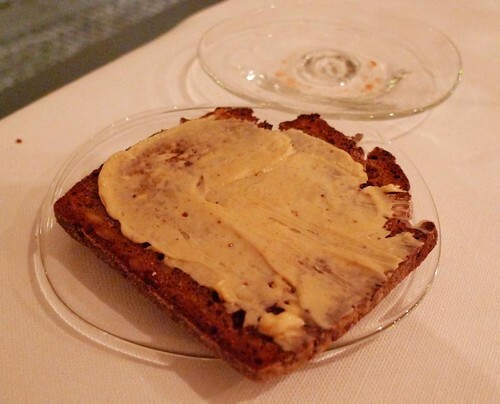 This time, coarser bread, and the butter was browned butter beaten with regular, cold butter to make a nutty, deep-tasting spread. Poached fish (I really can't remember what kind - sorry!) on top of tomato marmelade with olive tapenade and some special beans that were picked on a specific date - August 13 2008, I think! Like I said, it's in the details! The last main course, and probably my favorite. 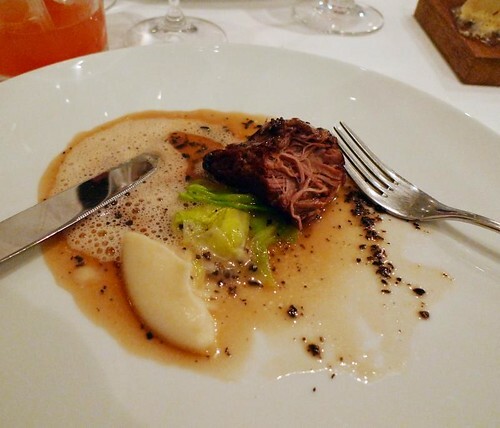 An extremely tender piece of veal, cooked sous-vide for three days. 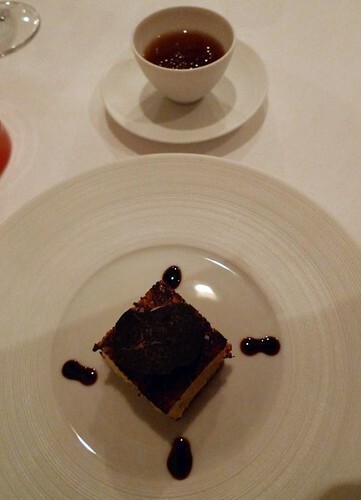 It was served with a truffle jus and onion cream. They do play a lot with chemistry, but they don't take it over the top. It's clear that the ingredients come first, and that they only use advanced techniques to really make the food shine. Some things were clearly inspired by restaurants such as WD-50, The Fat Duck and El Bulli - and since I probably can't afford to eat at either one (if I even get a table), this is about as close as I'll get! 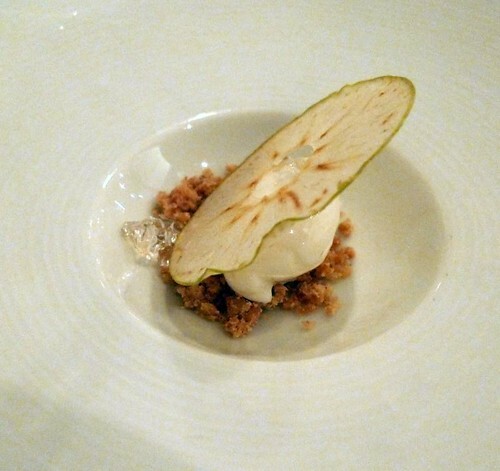 The desserts were just as good as the other food, and that's no surprise since Daniel Lindeberg is a really good pastry chef. The perfect transition from savoury to sweet - a little cheeseburger! 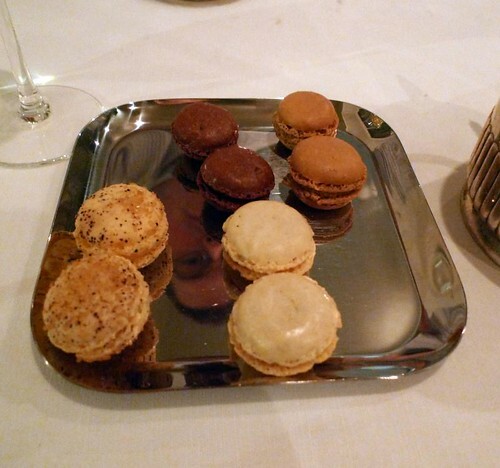 It's really an almond macaron, with chocolate truffle for the hamburger, shredded mint for the salad, some sort of sweet jelly instead of cheese, and raspberries instead of tomatoes. It came with "mustard and ketchup", of course! 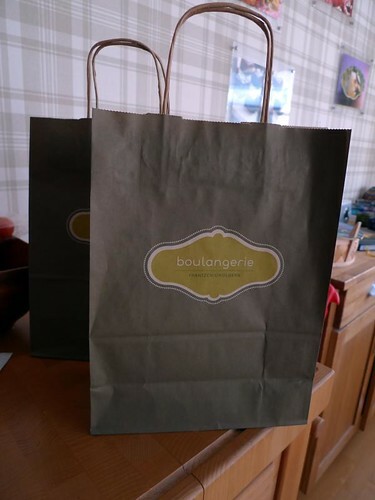 We were then sent home with a cute paper bag each. And it contained breakfast! 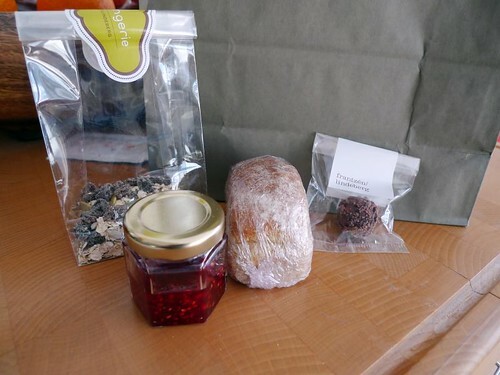 Bread, raspberry preserves, müesli and a chocolate truffle. I thought that was very sweet. The drawback? Well, the price. Dinner for two, with wine for one, one glass before dinner and a whisky afterward, and a non-alcoholic drink for me came to 4000 SEK. Despite that, I'm dying to go back - soon! Well, anniversaries are anniversaries. And I've heard it is to be worth the money which it certainly sounds like. Wow, that looks absolutley great!! YOu get hungry olny by looking at those pics. I guess in Germany you would pay even more than you did in Stockholm and it would not look as tasty as this. It looks fantastic and beautifully presented. Great fotos and great food as well! What more could one ask for? Except maybe less dent in the pocket? Congratulations on your anniversary! It's well worth remembering a 10th anniversary! Many thanks for sharing this moment. I'll be celebrating my wedding anniversary in july. Maybe I should book a table soon? happy anniversary! the food looks lovely. how funny as johan and i were just talking michelin stars yesterday. i have to say, you did pay a lot, but you also got a lot for that price. we ate at aquavit a few nights ago, with far less food, for nearly as much! upwards and onwards, my sister and i are eating at per se next month! Sounds and looks fantastic. Me and my DH were also recently talking about Michelin restaurants. I'm not sure if I'd like to (or ever be able to) go to one of the three star ones, but this looks very interesting. 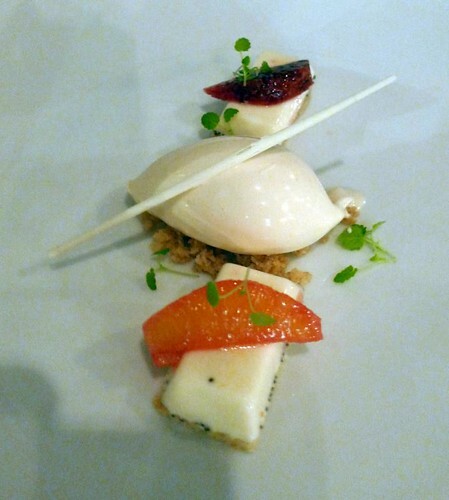 I want to thank you for your amazing documentation of your anniversary dinner at Frantzén-Lindeberg. Based upon your writing, we decided to have our 15th anniversary meal there as well. We had a choice between a five and seven course meal of which we had chosen the larger...but it seemed like much more than seven. The menu had some similar elements but a different presentation. We had an exceptional experience. Thank you for your recommendation.